16 cats went to PAWS today! Charli & Laura transported 6 friendlies and 10 ferals. There were 4 males and of the 12 females, one was already spayed (she had a wound so very good she went in), so the total for the day was 15. Dedra picked up once again. With this trip we have neutered 86 in September, 655 for the year and 10,100 since September of 2007. We are not going in on Friday - we're pooped! Remember, no cats between 10/8 & 10/29. 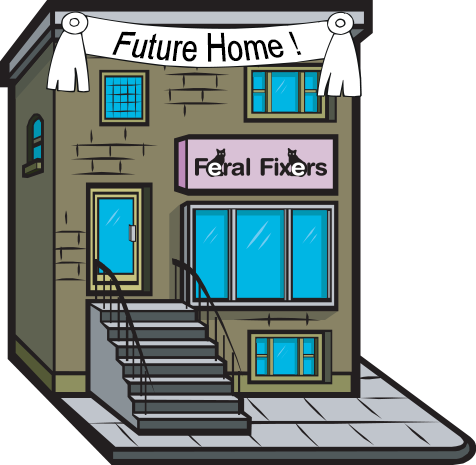 Went to see two properties today, working on a brick & mortar for Feral Fixers. First was a house. If we were beyond desperate, we would try to make it work. Skinny driveway, no parking, really. Many small rooms - good. Zoning was right and that is the 1st requirement. $190,000 asking. Lots of work. Not a good fit. 2nd was a corner unit of a business building. Windows on two sides - yea. Couple of rooms already built out. Storage possible within easy distance of back door, lots of flexibility. Zoned right. $2,100/mo lease, apartment tenants above. How long would we last with a cat yowling all night? It does happen. Do we have long-term income of $2,100/mo (before all the other expenses) - not at this time. Once the tenants were added to the equation it came down to a 7 out of 10. Owning would be ideal, old-school feeling that rent is just throwing money into a big hole. Don't even suggest Addison - no matter what the structure is, there is a 2 animal limit. Lombard and Villa Park seem flexible. We have a real estate agent that is very invested in helping us and we're trying to give her the best picture of what would work for us. Not easy when your resources rely on donations - they can change in an instant. Hoping the information is helpful to possible donors of money OR property. Think about it and talk about it! Stop at our booth on Sunday at Barkapalooza!